The name arborvitae is particularly used in the horticultural trade in the United States. It is Latin for "tree of life" - due to the supposed medicinal properties of the sap, bark and twigs. Despite its common names, it is not a true cedar in the genus Cedrus, nor is it related to the Australian white cedar, Melia azedarach. Unlike the closely related western red-cedar (Thuja plicata), northern white-cedar is only a small or medium-sized tree, growing to a height of 15 m (49 ft) tall with a 0.9 m (3.0 ft) trunk diameter, exceptionally to 38 metres (125 ft) tall and 1.8 metres (5.9 ft) diameter. The tree is often stunted or prostrate in less favorable locations. The bark is red-brown, furrowed and peels in narrow, longitudinal strips. Northern white-cedar has fan-like branches and scaly leaves. The foliage forms in flat sprays with scale-like leaves 3–5 millimetres (1⁄8–3⁄16 in) long. The seed cones are slender, yellow-green, ripening to brown, 9–14 millimetres (3⁄8–9⁄16 in) long and 4–5 millimetres (5⁄32–3⁄16 in) broad, with 6-8 overlapping scales. They contain about 8 seeds each. The branches may take root if the tree falls. 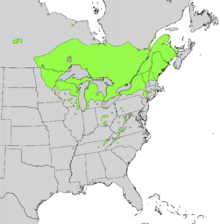 Northern white-cedar is native to an area in the southern part of eastern Canada and the adjacent part of the northern United States. It extends from southeastern Manitoba east throughout the Great Lakes region and into Ontario, Québec, New York, Vermont, New Hampshire, Maine, Prince Edward Island, New Brunswick, and Nova Scotia. There are isolated populations in west-central Manitoba, and to the south in Massachusetts, Connecticut, Ohio, and Illinois and in the Appalachian Mountains of Kentucky, Tennessee, North Carolina, Pennsylvania, Maryland, Virginia, and West Virginia. In Canada, its range reaches the Arctic treeline and the southern tip of Hudson Bay. It grows mainly in places with cooler summers, with an average temperature of 16 to 22 °C (61 to 72 °F) in July, and a shorter growing season, from 90 to 180 days. Northern white-cedar grows naturally in wet forests, being particularly abundant in coniferous swamps where other larger and faster-growing trees cannot compete successfully. It also occurs on other sites with reduced tree competition, such as cliffs. Although not currently listed as endangered, wild white-cedar populations are threatened in many areas by high deer numbers; deer find the soft evergreen foliage a very attractive winter food, and strip it rapidly. The largest known specimen is 34 m (112 ft) tall and 175 cm (69 in) diameter, on South Manitou Island within Leelanau County, Michigan. Northern white-cedar can be a very long-lived tree in certain conditions, with notably old specimens growing on cliffs where they are inaccessible to deer and wildfire; the oldest known living specimen is[when?] just over 1,100 years old, but a dead specimen with over 1,650 growth rings has been found. Despite their age, these very old trees are small and stunted due to the difficult growing conditions. The Witch Tree, a T. occidentalis growing out of a cliff face on Lake Superior in Minnesota, was described by the French explorer Sieur de la Verendrye as being a mature tree in 1731; it is still alive today. 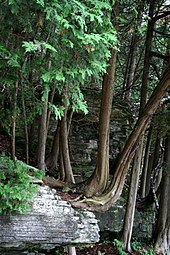 White-cedar specimens found growing on cliff faces in southern Ontario are the oldest trees in Eastern North America and all of Canada, growing to ages in excess of 1,653 years. White-cedar is a tree with important uses in traditional Ojibwe culture. Honored with the name Nookomis Giizhik ("Grandmother Cedar"), the tree is the subject of sacred legends and is considered a gift to humanity for its myriad uses, among them crafts, construction, and medicine. It is one of the four plants of the Ojibwe medicine wheel, associated with the north. White-cedar foliage is rich in Vitamin C and is believed to be the annedda which cured the scurvy of Jacques Cartier and his party in the winter of 1535–1536. Due to the presence of the neurotoxic compound thujone, internal use can be harmful if used for prolonged periods or while pregnant. Northern white-cedar is commercially used for rustic fencing and posts, lumber, poles, shingles and in the construction of log cabins. White-cedar is the preferred wood for the structural elements, such as ribs and planking, of birchbark canoes and the planking of wooden canoes. The essential oil within the plant has been used for cleansers, disinfectants, hair preparations, insecticides, liniment, room sprays, and soft soaps. 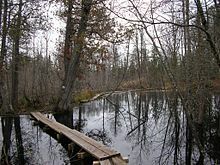 There are some reports that the Ojibwa made a soup from the inner bark of the soft twigs. Others have used the twigs to make teas to relieve constipation and headache. In the 19th century, T. occidentalis extract was in common use as an externally applied tincture or ointment for the treatment of warts, ringworm, and thrush. "An injection of the tincture into venereal warts is said to cause them to disappear." Strips of clear, northern white-cedar wood were used to make the original Au Sable river boats, formerly known as the "pickup trucks of the Au Sable". The light, rot resistant wood was preferred but is now commonly replaced by marine grade plywood. Since the plywood is available in lengths of 8 feet, the modern boats are slightly shorter than the older boats which were around 25 feet long. 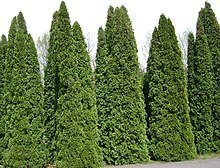 Northern white-cedar, often under the name arborvitae, is widely used as an ornamental tree, particularly for screens and hedges, in gardens, parks and cemeteries. Over 300 cultivars exist, showing great variation in colour, shape and size, with some of the more common ones being: 'Degroot's Spire', 'Ellwangeriana', 'Hetz Wintergreen', 'Lutea', 'Rheingold', 'Smaragd' (a.k.a. 'Emerald Green'), 'Techny', and 'Wareana'. It was introduced into Europe as early as 1540. ^ Farjon, A. (2013). "Thuja occidentalis". The IUCN Red List of Threatened Species. IUCN. 2013: e.T42262A2967995. doi:10.2305/IUCN.UK.2013-1.RLTS.T42262A2967995.en. Retrieved 14 December 2017. ^ a b c "Thuja occidentalis". Germplasm Resources Information Network (GRIN). Agricultural Research Service (ARS), United States Department of Agriculture (USDA). ^ a b c d e f g h Earle, Christopher J., ed. (2018). "Thuja occidentalis". The Gymnosperm Database. ^ a b Chambers, Kenton L. (1993). "Thuja occidentalis". In Flora of North America Editorial Committee (ed.). Flora of North America North of Mexico (FNA). 2. New York and Oxford. Retrieved 24 September 2016 – via eFloras.org, Missouri Botanical Garden, St. Louis, MO & Harvard University Herbaria, Cambridge, MA. ^ a b c Johnston, William F. (1990). "Thuja occidentalis". In Burns, Russell M.; Honkala, Barbara H. (eds.). Conifers. Silvics of North America. Washington, D.C.: United States Forest Service (USFS), United States Department of Agriculture (USDA). 1 – via Southern Research Station (www.srs.fs.fed.us). ^ "Eastern OLDLIST a database of ancient trees and their ages". Rocky Mountain Tree-Ring Research, Inc. & Eastern Kentucky University. 2008. Retrieved 22 August 2013. ^ a b "USDA/NRCS Plant Guide: Northern White Cedar, Thuja occidentalis L." (PDF). United States Department of Agriculture. Retrieved 2008-02-15. ^ "RHS Plant Selector – Thuja occidentalis 'Danica'". Retrieved 6 June 2013. ^ "RHS Plant Selector – Thuja occidentalis 'Holmstrup'". Retrieved 6 June 2013. ^ "RHS Plant Selector – Thuja occidentalis 'Rheingold'". Retrieved 6 June 2013. ^ "RHS Plant Selector – Thuja occidentalis 'Smaragd'". Retrieved 6 June 2013. Wikimedia Commons has media related to Thuja occidentalis.